The macaw is the largest of all the parrot species. There are seventeen different kinds of macaw and they range in size from a mall one foot in length to a huge three feet long. The largest macaws have a wingspan as large as sixty inches across!They have large, hooked beaks and bright, colorful feathers. These beaks are designed to crack open nuts, seeds, and fruits, which make up the majority of their diets. Macaws make excellent pets. Their tendency to mate for life translates into a strong attachment to their main human companion. They can even show signs of great jealousy when their human ignores them and pays attention to other humans or pets. If you are seeking a pet that is going to be a companion for many years, consider a macaw. The average lifespan of these birds is an impressive fifty years. Every macaw has facial features that are as individual as human fingerprints. Their personalities are just as varied. These birds can learn to mimic human speech. What's more, their intelligence allows them to answer simple questions. Being social creatures, they will follow their human around all day simply to be with them. Macaws are birds that need time outside their cages every day. Macaws do need approximately ten hours of sleep each night. A good rule of thumb is to choose a size that allows your bird to spread his wings fully and still have some room. For a cage of macaw stainless steel is the best material. These are strong enough to withstand the beaks that chew on the bars and they often last a lifetime. In addition, choose ones that have locking doors as these intelligent birds are great escape artists. Finally, choose a bar distance that is too small for your macaw to get his head through to prevent him getting it stuck. Finding a cage for your macaw can be a complicated and overwhelming task. Your favorite bird deserves a cage that is well equipped to serve as its home and a place in which it can be entertained for years to come. 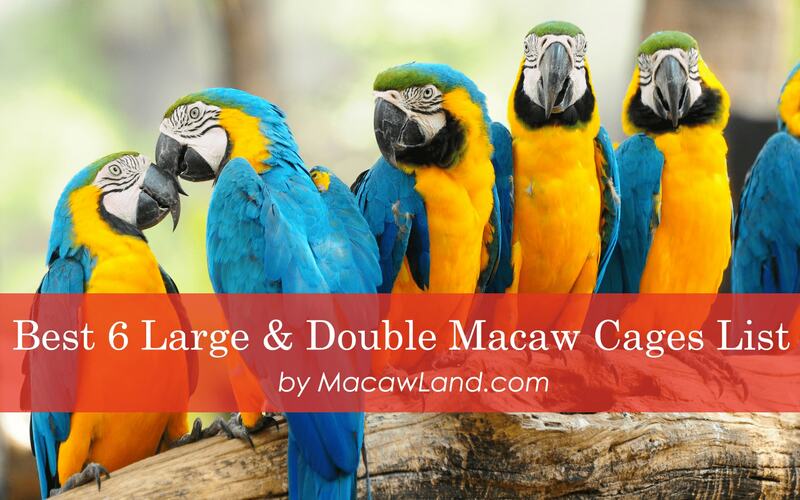 These six best macaw cages aim to help you narrow your decision and choose a cage that is absolutely perfect for your feathered friend. Cages for Macaws are made of sturdy metal frames that protect the bird but allow enough airflow for the bird to feel as if it is part of the outside environment. We recommend choosing a cage that ideally suits your environment as well, allowing the macaw to feel at home while its cage also matches your home decor. There is no reason to choose a cage that is completely contradictory to your environment. Choosing a cage that is sturdy, safe, and comfortable for your macaw should be the primary goals. Always make sure to keep the macaw's health and safety as your number one priority when selecting a cage. Analyzing the data and comparisons for each cage will help you to make your selection. Some cages are more spacious while others are portable and suited for those who live in smaller areas in which cages need to be moved regularly. Choosing a cage based upon what is finest for your bird's health while also finest for your living situation is the best route to take when making your decision. ​ 23.9"L x 22"W x 34.6"H (cage); overall height is 68". ​This is the largest cage produced by Prevue Pet Products and measures 78 3/4" high. It is 46" long, 36" wide, and has 1-3/8" wire spacing. The bottom grill and debris tray slide out for ease of cleaning. Assembly includes flathead hex bolts which birds have trouble unscrewing. Sturdy steel bowls and a hardwood perch are included with the cage. The design provides dependable sturdiness with a classically-styled shape. The door is a double-locking door for added security. The color is powder coated silver. It weighs about 140 lbs. ​This is the largest cage offered by Prevue Pet products. It is a beautiful and roomy cage that will provide a healthy living space for large breeds of birds. Pairs of birds could be kept in here but there are no accommodations for breeding. Clean up is convenient and many accessories are available separately from suppliers. ​The is cage is 78 3/4" high, 46" Long, and 36" Wide. Wire spacing is 1 3/8". It is one of Prevue's largest cages and is roomy. It is as large as the Dometop reviewed above, but with a modern, updated style. The cage comes with three stainless steel feed cups and one hardwood perch. Flathead hex bolts secure the cage so that birds can't unscrew them and escape. The bottom grill and tray remove for cleaning and the seed guards have rounded corners to help keep debris inside the cage instead of across your floor. If you choose not to use the bottom grill, this provides ten more inches of space for your bird. The finish is a black hammertone finish. ​With a modern take on the traditional curved styling, the Empire Extra Large Bird Cage is a great choice for large birds and pairs of birds. The wire spacing will allow smaller breeds like conures an easy escape. The updated look will fit attractively in any modern home decor. Size: ​23​.9"L x 22"W x 34.6"H (cage); overall height is 68". The cage measures 23.9L x 22W x 34.6’’H. Cage and stand are 67.7" together. The skirt is 31" x 29.5". This cage is intended for medium-sized birds. With a wire space of about 3/4 inch, smaller birds could squeeze through and large birds could mangle the bars. That said, cockatiels and love birds would enjoy the size of this cage, including its added play top on the roof. It is finished in a black powder coating for non-toxic protection of the metal. The cage comes with two wooden perches and five stainless steel bowls, and the play top has its own slide-out tray. For birds about the size of cockatiels, love birds, and conures. ​This cage would be perfect for cockatiels. The design has minimal style but is sturdy and practical. The play area adds extra space for birds to exercise and relax. Easy to move, clean, and enjoy, this cage will provide secure housing for several kinds of birds (or other pets). This cage is available in white, pale silver, and black/silver powder coating. Its measurements are 64” x 32" x 70" and provides an attractive design to fit in with any decor. It is 286 lbs. so special delivery is required and bird owners may need assistance assembling the product. Security measures include round locks for feeder doors and double trays for easy cleaning below. One unique feature is that it can be divided into two cages with two separate doors. Even though it is heavy, it rolls on six casters. ​This is a cage for large bird breeds and can be used for breeding. The sturdy design thwarts escape artists. With rounded corners, it provides a traditional yet modern style that will complement any home design. As a bonus, this dividing cage is available in three colors. Be patient during assembly and assemble it in the room it is intended for. It is 286 lbs. so special delivery is required and bird owners may need assistance assembling the product. Size: 24" L x 22" W x 37"H; overall height is 66". With locking casters this cage provides ease of movement and dependable lockdown at the same time. Door locks are snap locks to prevent birds escaping. The measurements are 24" wide x 22" deep x 37" high. The overall height of the cage and stand is 66" and the space between wires is 3/4". Included with the cage are five steel feeder cups and two perches (including ones for the play top). This would suit small macaws, love birds, conures, and cockatiels. It comes in a black/silver powder coated finish. The cage measures 24"x 22"x 61" tall. The overall height including the play top is an impressive 63.8". The wire spacing is 3/4", which would accommodate a few different sizes of birds, from small macaws to some African Greys. Larger birds may find it easy to bend the bars. Three feed bowls and two perches are included. This is an attractive cage that will not overwhelm a room with its size while providing practical and stylish housing for your bird. ​Compared to the other cages, this one had some variety in style, function, and compatibility with bird breeds. It can be used for one bird or pairs. It is not intended for parakeets or finches- they would endanger themselves or escape. Small macaw, Cockatiels and African Greys will find this cage comfortable. ​The play top area closes and disappears so that the curved rooftop design maintains its appearance. This is an attractive cage that will not overwhelm a room with its size while providing practical and stylish housing for your bird. Q: Do these cages come in other colors? A: Most only come in black. The King's Cages Superior Line ( #4 above) comes in white and silver as well. Q: How easy is it to clean these cages? A: The grill on some of these cages can be optional if you don't want to clean that. The trays slide out pretty easily and clean up quickly. Q: How easy are they to assemble? A: Smaller cages will probably take less time. It helps to set aside a couple of hours and have some assistance. Q: Are these cages heavy? A: Weights range from about 50 lbs. - 200+ lbs. Q: What accessories will fit these cages? A: Manufacturers and retail suppliers provide a variety of toys, perches, and feed cups. Contact them for specifics. Q: Do they make cage covers this big? A: Manufacturers provide cage covers as a separate purchase. In reviewing these products, there was always that one bird who could not only bend a bar but even break some or twist them into interesting shapes. These are sturdy cages but there can be no absolute guarantee that a particularly adventurous bird won't find some way to escape. Regular exercise and plenty of toys will help distract this kind of individual. Also, many cages ship in multiple boxes, so be aware of that. Assembly is straight forward, but some bird owners may need assistance during assembly. Putting the casters on first will make assembly easier, as well. Copyright © 2018 Macaw Land.All Rights Reserved.